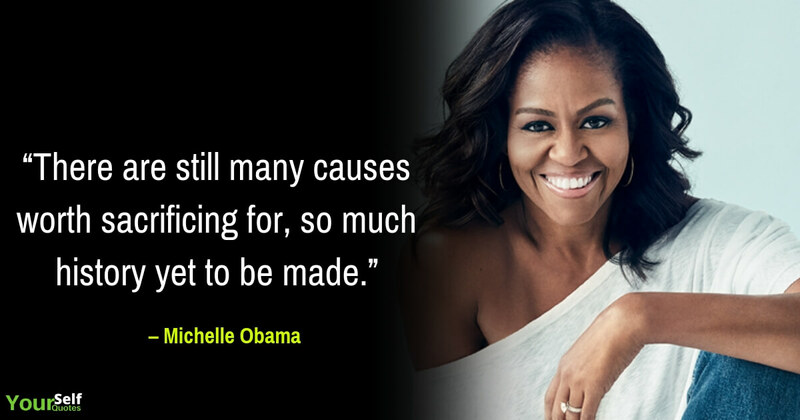 21 Impressive Michelle Obama Quotes by the most impressive Lady. These are the wisest words by an inspirational figure, Michelle Obama, who knows how to unite people on both sides of the aisle. She is the one who has power in her words and holds charisma in her personality. Through her influential quotes, she became a reason to inspire love and humanity among people. Michelle Obama, a lady from America, holds a list of the impressive set of titles; writer, advocacy icon, a lawyer, dog lover, hugger-in-chief. Yes, she is a famous writer & the first lady and wife of the 44th President of America, Barack Obama. Michelle Obama, the first African-American, First Lady of the United States, was born on January 17, 1964, in Chicago, Illinois. She was born and brought up in Chicago’s South Side. Her father, Fraser Robinson, was a city-pump operator & a Democratic precinct captain. And her mother, Marian, was a secretary at Spiegel’s. Michelle had an older brother, Craig with a difference of 21 months apart in age. She lived in a close-knit family, staying together. She graduated from Princeton University in 1985 & then went to earn a higher degree from Harvard Law School in 1988. She was awarded her J.D in 1988. Michelle worked as an associate in the Chicago branch of the firm Sidley Austin, after completing her Law school. Then in 1989, she met her prince, her would-be-husband, Barack Obama, to whom she was assigned as an adviser and eventually they both fell in love with each other. Finally, the couple got married at Trinity United Church of Christ on 3rd October 1992. They are blessed with two daughters Malia and Sasha, in 1998 and 2001 respectively. In 2002, Michelle started working as executive director of community relations & external affairs at University of Chicago Hospitals. In May 2005, she was appointed as Vice-President for the same. Michelle delivered a high profile speech at the Democratic National Convention in 2004, where caught the eye of a national audience for the first time. And on 20th January 2009, his husband, Barack Obama became 44th President of the United States. In May 2006, she won the title of “25 of the World’s Most Inspiring Women.” by the Essence Magazine. She also appeared twice on the cover of magazine Vogue and People magazine under best-dressed list. Michelle Obama, a strong inspiring lady wants us to be better citizens serving the world as we serve ourselves. She faced a lot of ups and downs in life, despite that she is full of integrity, loving, kind, and most importantly an individual who cares about her fellow human beings. To her, the most important job is the mother to the Presidential couple’s two children. Her life is full of courage & determination towards humanity and love towards the nation. Her words brought a positive change in the outlook of people, so her quotes and saying became famous among them. Reach out to the most expressive Quotes by Michelle Obama only at Yourself Quotes. 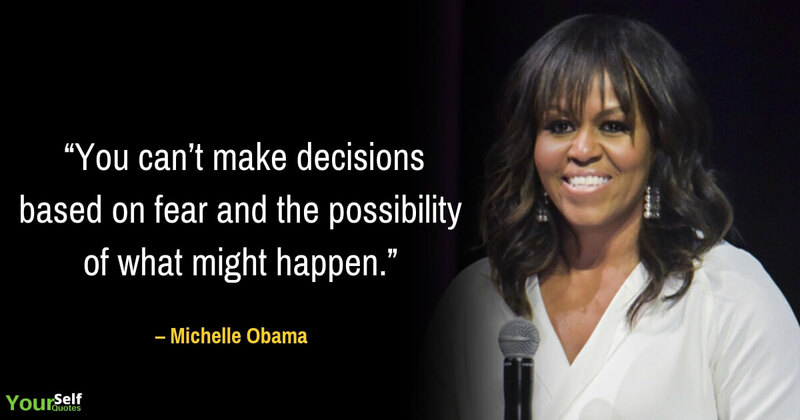 Make your life impressive and courageous just like Michelle Obama, by sharing her inspiring quotes with your friends and family on social media and other platforms.